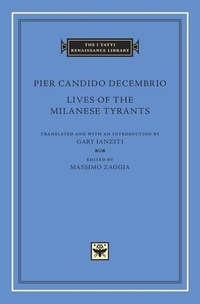 Lives of the Milanese Tyrants brings together two biographies by the most important Milanese humanist of the early fifteenth century. Pier Candido Decembrio (1399-1477) served as secretary and envoy to the bizarre and powerful Filippo Maria Visconti, Duke of Milan. As a member of the duke's inner circle, Decembrio was in a privileged position to write what historians agree is a unique masterpiece of Renaissance biography, based on his decades of direct experience. Also included in this volume is a work of homage to Visconti's successor, Decembrio's flattering account of the deeds of the most successful mercenary captain of the Renaissance, Francesco Sforza, who secured for himself and his heirs the disputed position of Duke of Milan through guile, force, and willpower. Both works are translated into English here for the first time from new Latin texts prepared specially for this edition.